MATERNITY LEAVE. It is essential that you read all the guidance in these maternity leave pages. Download "MATERNITY LEAVE. It is essential that you read all the guidance in these maternity leave pages." 2 BEFORE THE BIRTH Action required by employee No later than the 15th week before the expected week of childbirth you should meet with your line manager to discuss and complete the Maternity Leave Plan which will provide the relevant information and notice to your department in respect of your pregnancy. You should advise your manager whether you intend to return to work after the birth of your child. If you do intend to take maternity leave you should notify your manager of the date on which you wish to begin your maternity leave. If you do not intend to return to work after the birth of your baby, your manager can outline your entitlement to statutory maternity benefits to you. Provide notification to your department in respect of your antenatal appointments. If you change the date on which you wish to start your maternity leave after you have filled in your Maternity Leave Plan, you must give 28 days' notice of the proposed new start date. Discuss with your manager whether you would like to undertake any Keeping in Touch days. Agree with your manager arrangements for staying in touch, if you wish to do so, during your maternity leave. Action required by the department As soon as you are informed of the employee's pregnancy you should arrange to carry out appropriate risk assessments. Clarify with your employee what notice and information you expect from her in relation to her antenatal appointments. No later than the 15th week before the expected week of childbirth meet with your employee to discuss and complete the Maternity Leave Plan. Within 28 days of completing the Maternity Leave Plan, if the employee plans to return to work, confirm the return to work date with her in writing. University maternity scheme All women employed by the University who meet the relevant qualifying provisions, and who have expressed the intention to return to work following the birth of their child regardless of their staff group, grade or hours worked, are eligible for the provisions of the University Maternity Scheme. 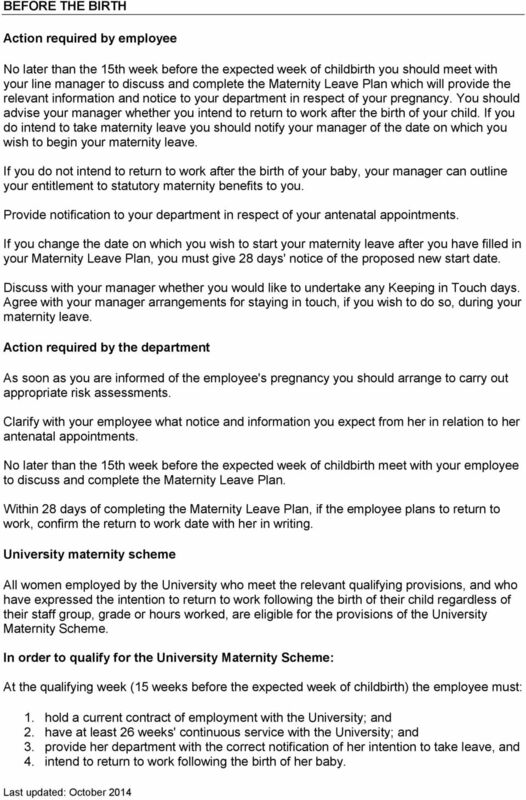 In order to qualify for the University Maternity Scheme: At the qualifying week (15 weeks before the expected week of childbirth) the employee must: 1. hold a current contract of employment with the University; and 2. have at least 26 weeks' continuous service with the University; and 3. provide her department with the correct notification of her intention to take leave, and 4. intend to return to work following the birth of her baby. 3 If she meets all these requirements, and her contract of employment will continue throughout the entire period of the proposed maternity leave, the employee will be eligible to receive the benefits of the University maternity leave scheme as follows: 26 weeks' full pay (inclusive of any statutory maternity pay which is due); followed by 13 weeks' statutory maternity pay (if a woman does not meet all the statutory qualification rules for statutory maternity pay, she will only receive pay for the first 26 weeks of maternity leave); followed by 13 weeks' unpaid leave Total maternity leave = 52 weeks If the contract will expire during the proposed maternity leave period, then payments under the contractual scheme will end at the contract end date. SMP payments (see below) may continue. Payments under the University Maternity Scheme consist of two elements, contractual pay and Statutory Maternity Pay (SMP). SMP is a weekly government benefit that is paid by the employer to women who meet the qualifying criteria. Contractual pay is the pay that the University pays over and above the statutory minimum. To qualify for SMP, the woman must have been continuously employed with the same employer for at least 26 weeks continuing into the qualifying week (the 15th week before the week her baby is due) and have average weekly earnings above the National Insurance lower earnings limit. There are other qualifying conditions relating to SMP that depend on individual circumstances, but payroll can confirm whether a woman is eligible for SMP at the appropriate time. SMP is paid over the first 39 weeks of maternity leave at the rate of: 90% of average weekly earnings (this figure is worked out at the qualifying week) for each of the first six weeks of maternity leave, followed by 33 weeks of flat rate SMP ( a week from 6 April 2014) or 90% of average weekly earnings if that is less than a week. The flat rate is subject to review every April. 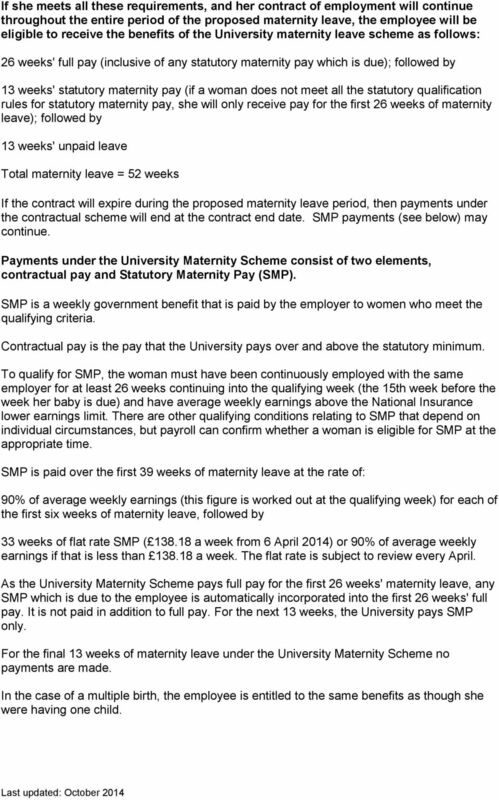 As the University Maternity Scheme pays full pay for the first 26 weeks' maternity leave, any SMP which is due to the employee is automatically incorporated into the first 26 weeks' full pay. It is not paid in addition to full pay. For the next 13 weeks, the University pays SMP only. For the final 13 weeks of maternity leave under the University Maternity Scheme no payments are made. In the case of a multiple birth, the employee is entitled to the same benefits as though she were having one child. 8 appointment has been made. Fathers and partners of pregnant women do not have the right to time off to accompany their partners to antenatal appointments, as the legal provision applies only to pregnant employees. Time off that might be required to accompany pregnant women to appointments should be requested as annual leave in the normal way from the employing department. Annual leave Contractual annual leave (including bank holidays and fixed closure days) will accrue throughout the full 52 weeks of maternity leave. Departments may wish to ask women to take any accrued annual leave prior to their maternity leave. You may also ask that a woman takes at least 28 days' annual leave (the annual statutory holiday requirement) before she goes on maternity leave if she will not return to work before the end of the current leave year. In the event that a maternity leave period crosses over two annual leave years, you may ask a woman returning to work to use up the balance of her annual leave from the leave year that has ended at the end of her maternity leave period. However, departments retain the right to make annual leave arrangements with their employees to fit in with operational requirements. Women may wish to consider retaining some of their annual leave to allow them to take time off as required to look after their children should they be ill, or need some additional support whilst settling into a nursery or with new childcarers. It should be clarified early on that whilst a small amount of paid leave is available to staff for dealing with domestic emergencies this is not intended to cover foreseeable domestic problems such those outlined above, and in most cases it would be anticipated that annual leave would be used to cover such circumstances. It may be necessary to clarify that the University sick leave scheme only covers the sickness of the employee and not sickness suffered by any of their dependents. Other benefits During the whole period of maternity leave the employee is entitled to receive all her contractual benefits with the exception of remuneration. This includes all non-cash benefits such as childcare vouchers. 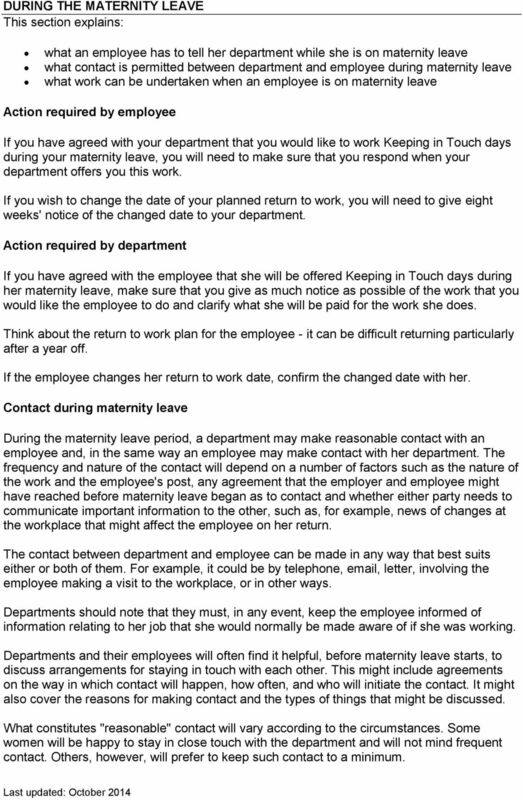 9 DURING THE MATERNITY LEAVE This section explains: what an employee has to tell her department while she is on maternity leave what contact is permitted between department and employee during maternity leave what work can be undertaken when an employee is on maternity leave Action required by employee If you have agreed with your department that you would like to work Keeping in Touch days during your maternity leave, you will need to make sure that you respond when your department offers you this work. If you wish to change the date of your planned return to work, you will need to give eight weeks' notice of the changed date to your department. Action required by department If you have agreed with the employee that she will be offered Keeping in Touch days during her maternity leave, make sure that you give as much notice as possible of the work that you would like the employee to do and clarify what she will be paid for the work she does. Think about the return to work plan for the employee - it can be difficult returning particularly after a year off. If the employee changes her return to work date, confirm the changed date with her. Contact during maternity leave During the maternity leave period, a department may make reasonable contact with an employee and, in the same way an employee may make contact with her department. The frequency and nature of the contact will depend on a number of factors such as the nature of the work and the employee's post, any agreement that the employer and employee might have reached before maternity leave began as to contact and whether either party needs to communicate important information to the other, such as, for example, news of changes at the workplace that might affect the employee on her return. The contact between department and employee can be made in any way that best suits either or both of them. For example, it could be by telephone, , letter, involving the employee making a visit to the workplace, or in other ways. Departments should note that they must, in any event, keep the employee informed of information relating to her job that she would normally be made aware of if she was working. Departments and their employees will often find it helpful, before maternity leave starts, to discuss arrangements for staying in touch with each other. This might include agreements on the way in which contact will happen, how often, and who will initiate the contact. It might also cover the reasons for making contact and the types of things that might be discussed. 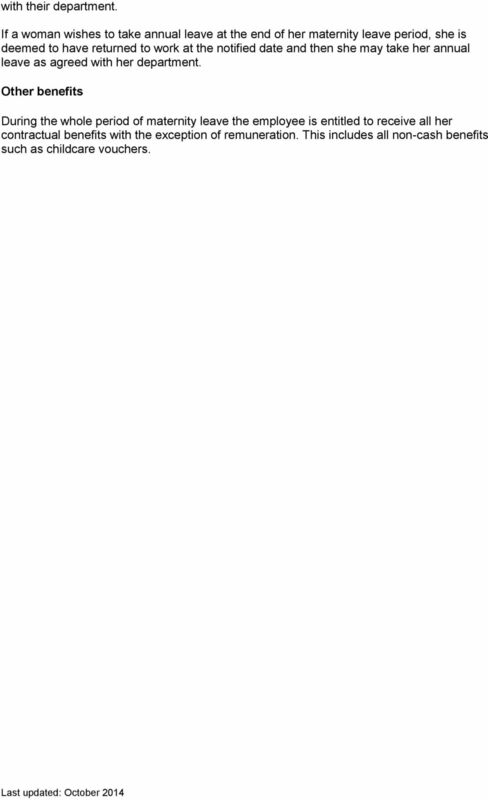 What constitutes "reasonable" contact will vary according to the circumstances. Some women will be happy to stay in close touch with the department and will not mind frequent contact. Others, however, will prefer to keep such contact to a minimum. 10 There is a section on the Maternity Leave Plan for the employee to note her preferences in this respect. Payment for keeping in touch (KIT) days As KIT days allow work to be carried out under the employee's contract of employment, the employee is entitled to be paid for that work. The rate of pay is a matter for agreement with the department, but may be agreed on a case-by-case basis. It is suggested that if a woman attends for work, she is paid the equivalent of her normal hourly rate for the hours she works on the day in question. Therefore during the period that she is being paid at the rate of full pay, no further payment would be due. It is suggested that if a woman works a KIT day in a week in which she is receiving SMP only, then her pay should be made up to the equivalent of full pay for the hours worked over and above the amount received under SMP rules. She will continue to be paid her SMP for the week in which the work is done. There is a maximum limit of ten KIT days allowed under the new regulations and once a woman has used up her ten KIT days and she does any further work, she will lose a week's SMP for the week in the Maternity Pay Period in which she has done that work. The hours to be worked and the pay for those hours must be agreed in advance between the department and the employee. Any questions from departments about payment during KIT days should be directed to their HR Business Partner. Notification of change of return to work dates while on maternity leave Unless otherwise notified, the date on which an employee returns to work will normally be the first working day 52 weeks after her maternity leave began. This is because all employees are entitled to 26 weeks' OML and 26 weeks' AML. (i) Return to work before the end of the maternity leave period If the employee wishes to return to work before the end of her full maternity leave period (this will normally be the end date that the department confirmed to her before she went on leave), she must give her department eight weeks' notice of her return to work. This notice requirement applies during the full period of leave. The notice period is the minimum that the department is entitled to expect, but the department may, at its discretion, accept less notice. If the employee tries to return to work without having given the appropriate eight weeks' notice, the department may postpone her return until the end of the eight weeks' notice period. However, the department may not postpone her return to a date later than the end of her maternity leave period. (ii) Return to work later than previously notified An employee who has notified her department that she wishes to return to work before the end of her 52 weeks' entitlement to maternity leave, is entitled to change her mind. However, in these circumstances, she should give her department notice of this new, later date at least eight weeks before the earlier date. 12 with their department. If a woman wishes to take annual leave at the end of her maternity leave period, she is deemed to have returned to work at the notified date and then she may take her annual leave as agreed with her department. Other benefits During the whole period of maternity leave the employee is entitled to receive all her contractual benefits with the exception of remuneration. This includes all non-cash benefits such as childcare vouchers. 13 AFTER THE MATERNITY LEAVE This section explains: an employee's rights on returning to work following maternity leave the health and safety provisions which apply to new mothers at work what happens to pensions contributions during maternity leave matters relating to taking time off to care for sick dependents or domestic emergencies Rights on return to work An employee who returns to work after maternity leave is entitled to return to the same job on the same terms and conditions as if she had not been absent, unless a redundancy situation has arisen. In addition, if there is a reason other than redundancy which means that it is not reasonably practicable for the University to take her back to the same job, she is entitled to be offered suitable alternative work, if this can be identified. Employees also have the right to request flexible working and the employing department has a duty to seriously consider that request. If an employee wishes to work a flexible working pattern on a temporary basis to ease her return to work, she should discuss this with her department as soon as possible. Employees returning from maternity leave also have a separate entitlement to parental leave which is a period of unpaid leave. See also Additional Paternity Leave. 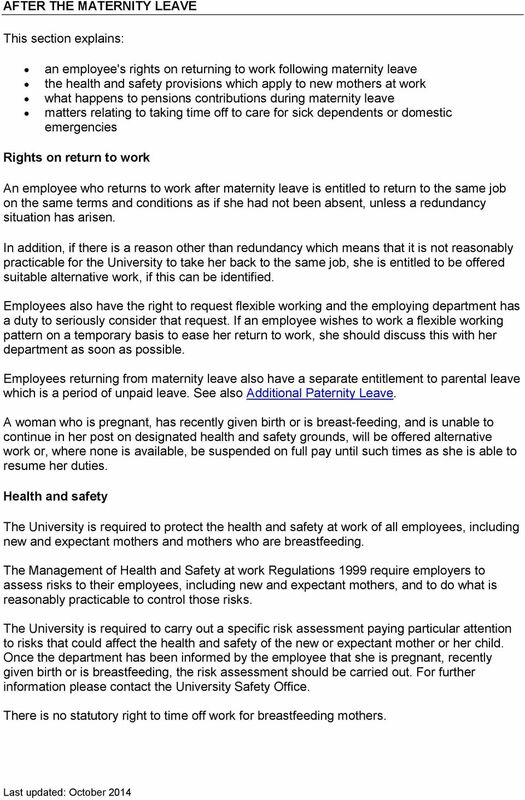 A woman who is pregnant, has recently given birth or is breast-feeding, and is unable to continue in her post on designated health and safety grounds, will be offered alternative work or, where none is available, be suspended on full pay until such times as she is able to resume her duties. 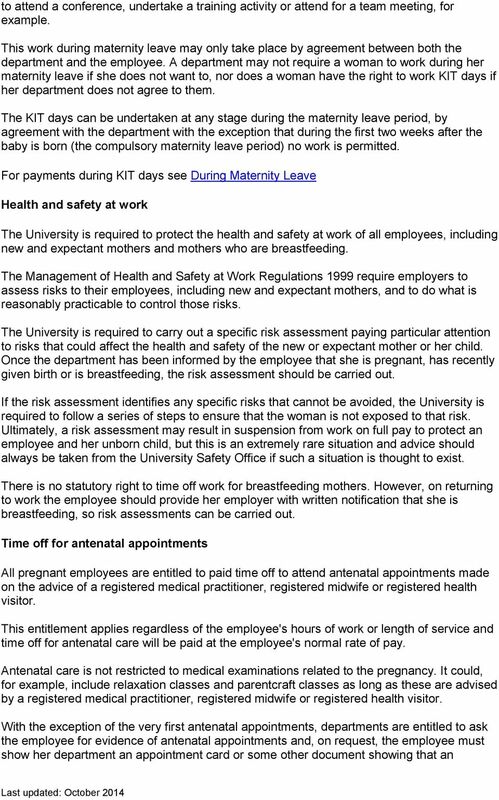 Health and safety The University is required to protect the health and safety at work of all employees, including new and expectant mothers and mothers who are breastfeeding. The Management of Health and Safety at work Regulations 1999 require employers to assess risks to their employees, including new and expectant mothers, and to do what is reasonably practicable to control those risks. The University is required to carry out a specific risk assessment paying particular attention to risks that could affect the health and safety of the new or expectant mother or her child. Once the department has been informed by the employee that she is pregnant, recently given birth or is breastfeeding, the risk assessment should be carried out. For further information please contact the University Safety Office. There is no statutory right to time off work for breastfeeding mothers. 15 may do so and the University must pay its corresponding share. The Pensions Office will be able to advise the employee on her individual situation. Annual leave/ caring for those who are sick, and dealing with domestic emergencies In the early days of settling a very small child into a new care arrangement, in a nursery or with a childcarer, there are often quite a number of matters which may require new mothers to be absent from the workplace, such as minor illness to be dealt with, or teething problems with new care arrangements. New mothers may wish to consider retaining some of her accrued holiday leave to enable them to deal with these situations. Whilst absence from work to attend to an emergency such as the sickness of a member of your immediate family or equivalent, or to attend to a family or domestic emergency will normally be paid in the first instance, it is intended that this is to enable employees to make the necessary arrangements for continued care or attention. Such paid leave will therefore normally be very limited (from half a day to no more than two days) and is not intended to cover repeated absences for minor problems, but rather to deal with exceptional circumstances. Additional leave, which will normally be unpaid or taken as annual leave, may be granted. In certain exceptional circumstances your department may grant a further limited period of paid leave for these purposes. It is important that these provisions are not abused and departments will monitor the frequency of leave requests. 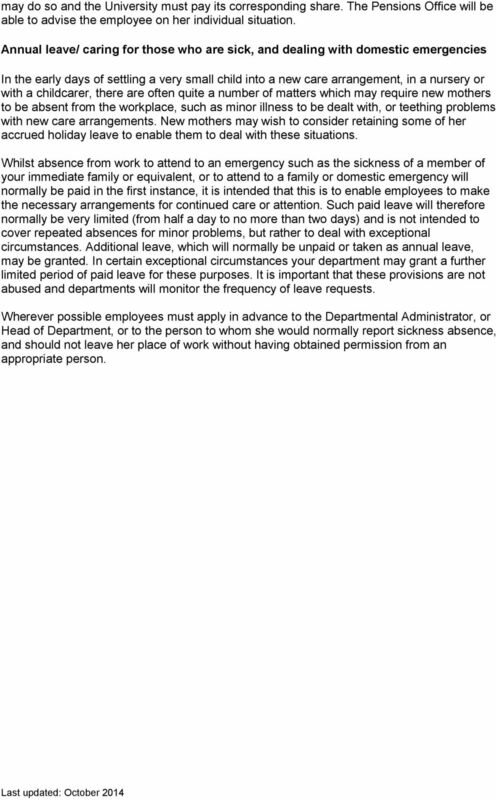 Wherever possible employees must apply in advance to the Departmental Administrator, or Head of Department, or to the person to whom she would normally report sickness absence, and should not leave her place of work without having obtained permission from an appropriate person. 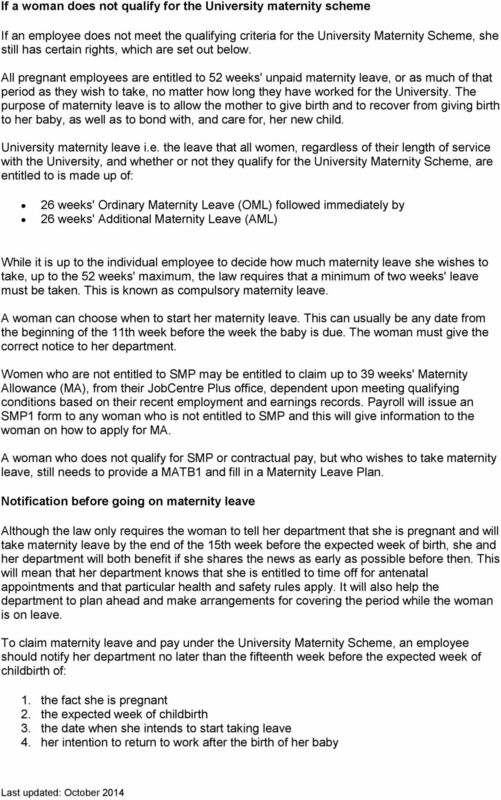 16 SUMMARY OF THE MATERNITY LEAVE SCHEME Application All women employed by the University who meet the relevant qualifying criteria, and regardless of their staff group, grade or hours worked, will be eligible for the provisions of the University maternity leave scheme. 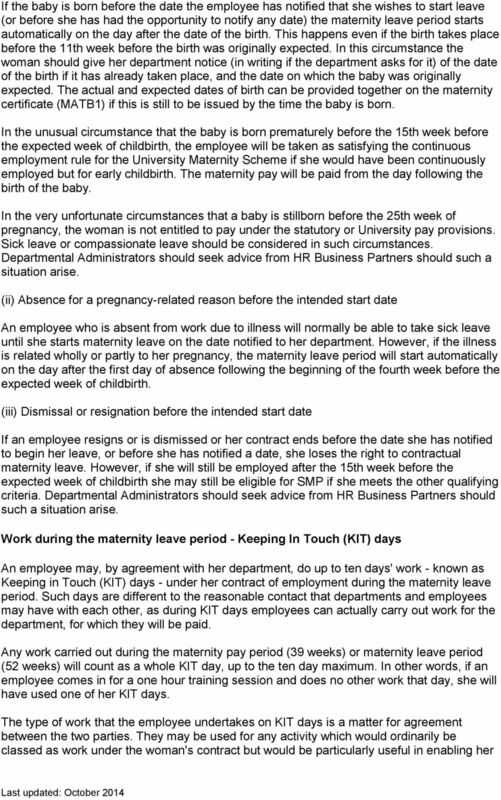 Qualification In order to qualify for the University maternity leave scheme, at the 15th week before the expected week of childbirth an employee should: 1. hold a current contract of employment with the University; and 2. have at least 26 weeks' continuous service with the University; and 3. provide her department with the correct notification of her intention to take leave, and 4. intend to return to work following the birth of her baby. Note that contractual pay will only apply where you have a current contract of employment with the University. 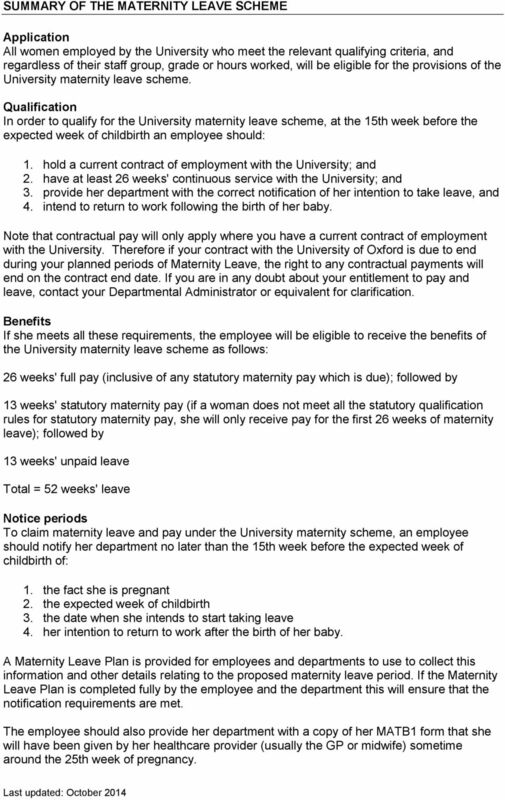 Therefore if your contract with the University of Oxford is due to end during your planned periods of Maternity Leave, the right to any contractual payments will end on the contract end date. If you are in any doubt about your entitlement to pay and leave, contact your Departmental Administrator or equivalent for clarification. Benefits If she meets all these requirements, the employee will be eligible to receive the benefits of the University maternity leave scheme as follows: 26 weeks' full pay (inclusive of any statutory maternity pay which is due); followed by 13 weeks' statutory maternity pay (if a woman does not meet all the statutory qualification rules for statutory maternity pay, she will only receive pay for the first 26 weeks of maternity leave); followed by 13 weeks' unpaid leave Total = 52 weeks' leave Notice periods To claim maternity leave and pay under the University maternity scheme, an employee should notify her department no later than the 15th week before the expected week of childbirth of: 1. the fact she is pregnant 2. the expected week of childbirth 3. the date when she intends to start taking leave 4. her intention to return to work after the birth of her baby. A Maternity Leave Plan is provided for employees and departments to use to collect this information and other details relating to the proposed maternity leave period. If the Maternity Leave Plan is completed fully by the employee and the department this will ensure that the notification requirements are met. 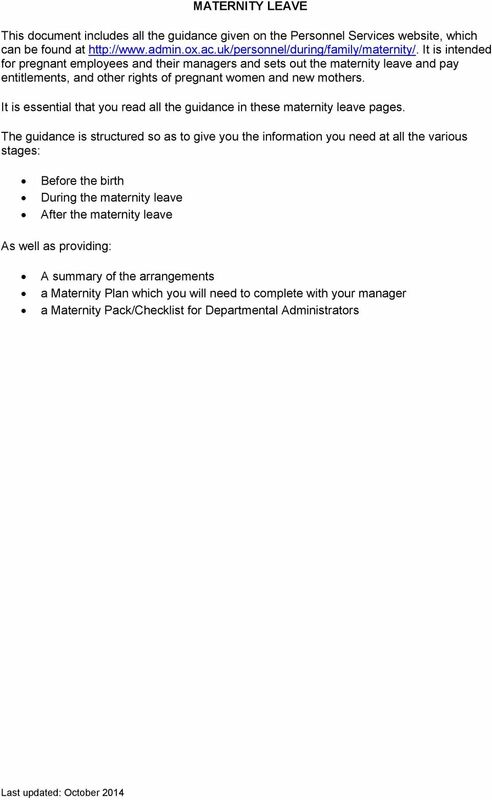 The employee should also provide her department with a copy of her MATB1 form that she will have been given by her healthcare provider (usually the GP or midwife) sometime around the 25th week of pregnancy. 17 Start of maternity leave/pay A woman can choose to start her maternity leave any time after the beginning of the 11th week before the expected week of childbirth, and may change her chosen start date by giving 28 days notice. Maternity Leave will start automatically if she gives birth before her notified date or is ill for a pregnancy-related reason during the last four weeks of her pregnancy. During maternity leave The employer may make contact with the employee (and vice versa) while she is on maternity leave, as long as the amount and type of contact is not unreasonable (e.g. to discuss plans for returning to work or to keep her informed of important developments in the workplace). Work during the maternity leave period - keeping in touch days The employee can undertake up to a maximum of ten days' work under her contract of employment during her maternity leave, as long as both she and her department have agreed for this to happen, and agree on what work is to be done and how much she will be paid for it. Returning to work It is assumed that an employee will return to work at the end of her full 52 weeks of maternity leave unless she has told her department that she wishes to come back at any other time. The employee can return to work earlier than the full 52 weeks of maternity leave, or can change the date of her return to work, as long as she gives eight weeks' notice to her department. 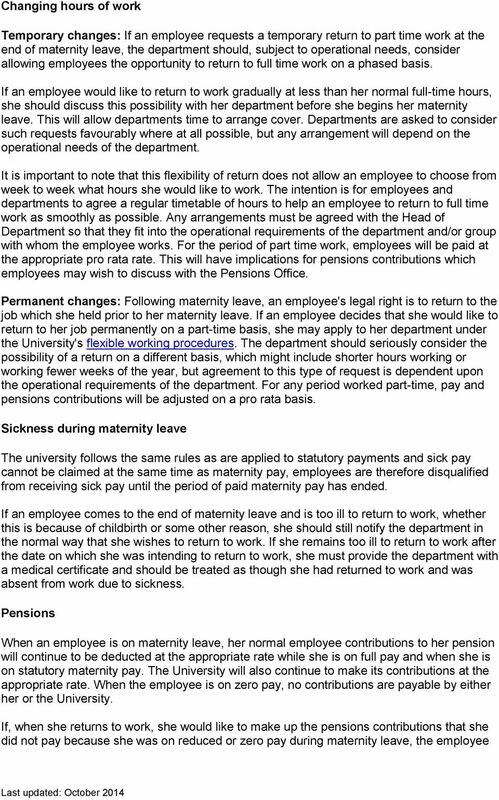 If an employee decides not to return to work at the end of her maternity leave, or returns to work for less than three months, the University reserves the right to reclaim all or part of the payments made under the University scheme, minus any statutory maternity pay element to which the employee was eligible. End of contract during maternity leave If a woman's contract is due to end during her maternity leave period normal arrangements for ending contracts will apply. However, it is recommended that the Administrator contacts his/her HR Business Partner for guidance on the appropriate procedures. If the woman has provided written confirmation that she wishes the department to seek suitable alternative employment for her within the University, this should be sought in the normal way. 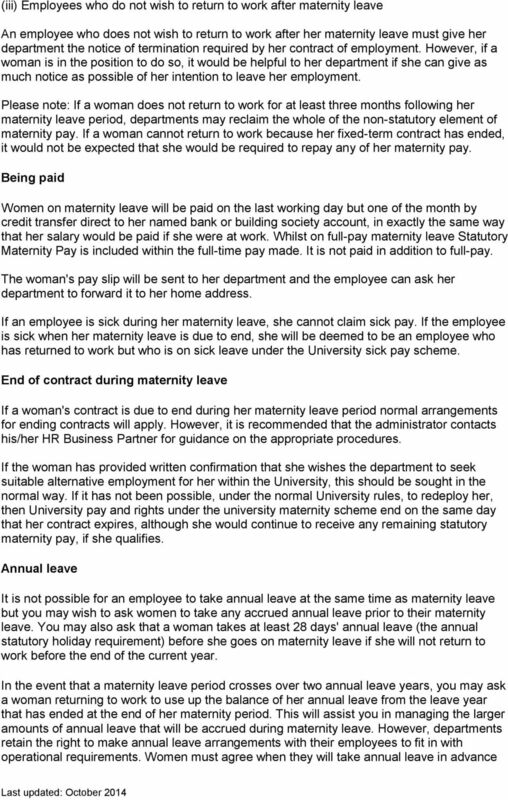 If it has not been possible, under the normal University rules, to redeploy her, then University pay and rights under the University maternity scheme end on the same day that her contract expires, although she would continue to receive any remaining statutory maternity pay, if she qualifies. 18 MANAGING THE LEAVE - CHECKLIST FOR DEPARTMENTAL ADMINISTRATORS This checklist should be used as a guide to ensure that all aspects of an employee's maternity leave have been addressed. a) When your employee tells you she is pregnant 1. Arrange a workplace assessment. Employers are required by law to protect the health and safety of employees who are pregnant, have recently given birth, or who are breastfeeding. Protection on these grounds starts as soon as you know your employee is pregnant, so the assessment should be a made as a priority following notification of the pregnancy. 2. Explain your employee's right to time off for ante-natal care, and that except in the case of her first appointment, the employee must be prepared to show you evidence of such appointments. 3. Explain the time scales for notification and direct your employee to the information on maternity on the Personnel Services. b) At the qualifying week (15 weeks before the baby is due) 1. Check that you have issued a university for completion Completing the maternity plan is not a legal requirement to be able to claim maternity leave and pay, but it will give you all the information which you will need. If you can go through the form with your employee it will help you to ensure that your employee also understands her entitlements and obligations. Make sure that you use the maternity tables to check the correct dates for the qualifying week. 2. 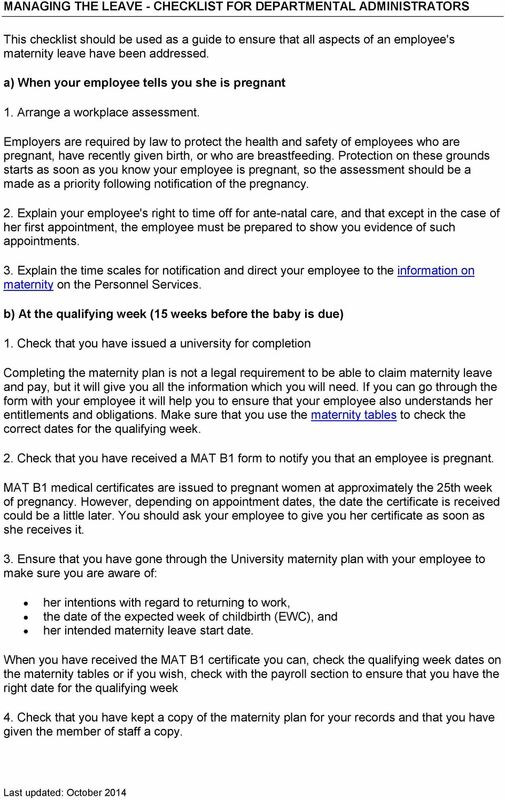 Check that you have received a MAT B1 form to notify you that an employee is pregnant. MAT B1 medical certificates are issued to pregnant women at approximately the 25th week of pregnancy. However, depending on appointment dates, the date the certificate is received could be a little later. You should ask your employee to give you her certificate as soon as she receives it. 3. Ensure that you have gone through the University maternity plan with your employee to make sure you are aware of: her intentions with regard to returning to work, the date of the expected week of childbirth (EWC), and her intended maternity leave start date. When you have received the MAT B1 certificate you can, check the qualifying week dates on the maternity tables or if you wish, check with the payroll section to ensure that you have the right date for the qualifying week 4. Check that you have kept a copy of the maternity plan for your records and that you have given the member of staff a copy. 20 EMPLOYEES MATERNITY LEAVE PLAN Before completing this form you must read all the guidance on maternity leave available from the Personnel Services website. You should complete this form together with your Departmental Administrator. Telling your Departmental Administrator you are pregnant You can tell your Departmental Administrator you are pregnant as soon as you want to. This can be before you have decided when to start maternity leave, and before you give your Departmental Administrator this form. You will need to tell your Departmental Administrator if you want to take paid time off for antenatal appointments. The latest date you can inform your Departmental Administrator of your pregnancy is the 15th week before your expected week of childbirth (the qualifying week). Form MATB1, which you will receive from your midwife or doctor will tell you the date your baby is due. Your qualifying week can then be worked out. Your Departmental Administrator can help you with this. Your Departmental Administrator needs to make health and safety checks (e.g. about DSE, manual lifting, etc.) when he or she knows you are pregnant in order to protect you and your baby, so the earlier you feel able to tell your department, the sooner these checks can be made. 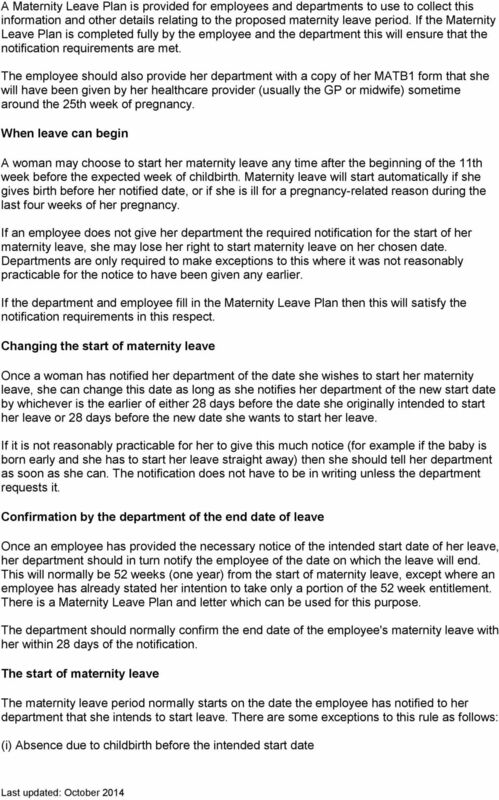 Telling your Departmental Administrator when you want to take maternity leave You must tell your Departmental Administrator by the 15th week before your expected week of childbirth the date on which you want to start your maternity leave and begin to receive maternity pay. You should therefore give this completed form to your Departmental Administrator at the latest during the 15th week before your expected week of childbirth. 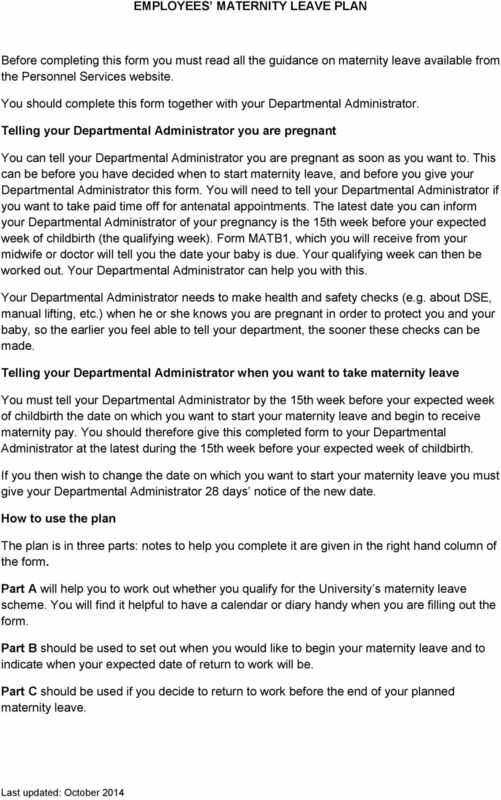 If you then wish to change the date on which you want to start your maternity leave you must give your Departmental Administrator 28 days notice of the new date. How to use the plan The plan is in three parts: notes to help you complete it are given in the right hand column of the form. Part A will help you to work out whether you qualify for the University s maternity leave scheme. You will find it helpful to have a calendar or diary handy when you are filling out the form. Part B should be used to set out when you would like to begin your maternity leave and to indicate when your expected date of return to work will be. Part C should be used if you decide to return to work before the end of your planned maternity leave. 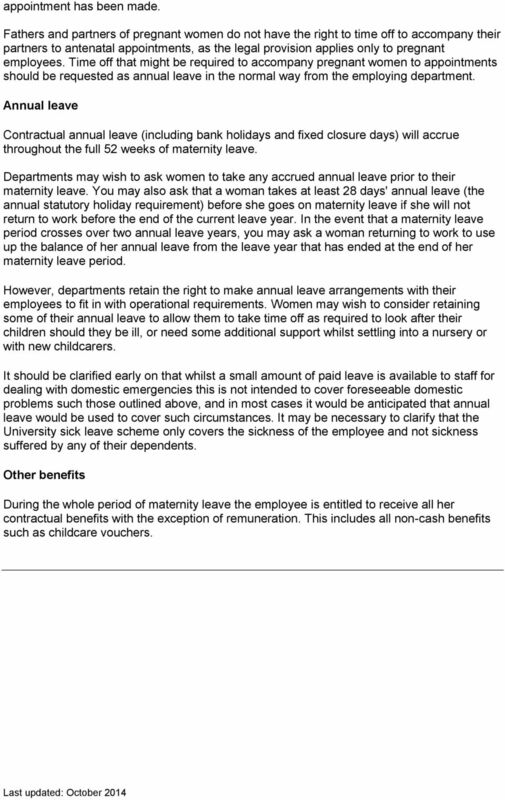 21 PART A WORKING OUT YOUR ELIGIBILITY FOR LEAVE AND PAY TO THE DEPARTMENTAL ADMINISTRATOR I am giving you this form to let you know that I am pregnant and to notify you of when I want to start my maternity leave and to begin receiving maternity pay (if eligible). Personal Details 1. Name: Department:... Departmental Administrator s name:.. Guidance Notes When the baby is expected 2. My baby is due in the week beginning: Sunday. (date of expected week of childbirth) Expected week of childbirth The expected week of childbirth is the week, beginning Sunday, in which it is expected you will have your baby. This is the date on your MATB1 form that your doctor or midwife will give you. 3. A certificate (MATB1) confirming this: relevant box Tick a) Has been given to you already b) Is enclosed with this form Certificate Your doctor or midwife will give you a MATB1 form which will give you the expected week of childbirth. You must give this to your Departmental Administrator at least 28 days before you wish to start your leave. c) Will be given to you as soon as possible Qualifying for the University s maternity scheme Filling in this section of the form will enable you and your administrator to see if you qualify for the university maternity scheme and statutory maternity pay. ADOPTION LEAVE. It is essential that you read all the guidance in these adoption leave pages. The Work and Families Act 2006 introduced changes which will apply to you if your baby is due on or after 1 April 2007. We are committed to equality and diversity and the provision of practices which enable staff members to manage their work/life balance. HUMAN RESOURCES MATERNITY LEAVE, ADOPTION LEAVE AND PAY PROCEDURE Equality and Diversity This Policy will be applied in a non-discriminatory way, in line with the School s Equality and Diversity policies. 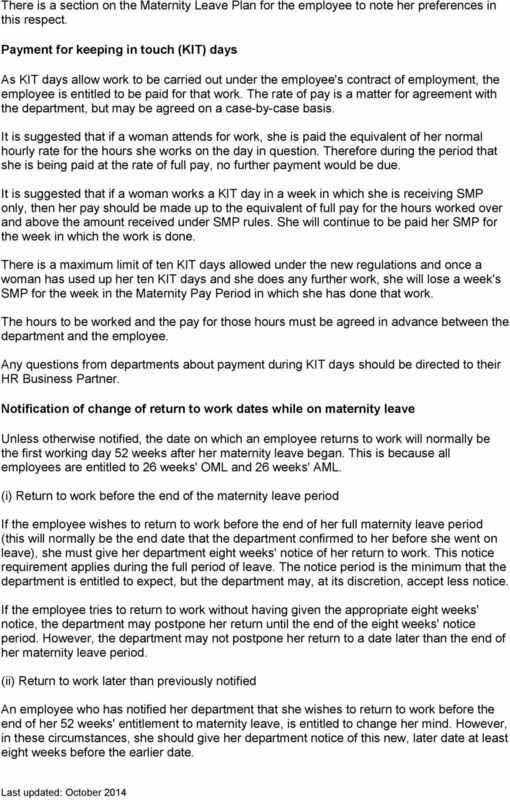 leave Maternity and pay Your Rights Know April 2007 Edition Are you a mum-to-be and in work? Then your maternity rights have just got better. 1.1 This document sets out the statutory rights and responsibilities of staff who wish to take paternity leave. FREQUENTLY ASKED QUESTIONS TERMS & CONDITIONS - Updated Jan15 ANNUAL LEAVE SICK LEAVE MATERNITY & PATERNITY LEAVE SPECIAL LEAVE NOTICE PERIODS ANNUAL LEAVE Q1. HOW MUCH ANNUAL LEAVE AM I ENTITLED TO? A1. University policy and practice regarding student pregnancy and maternity Overview 1. As a result of the Equality Act 2010, the legislation on pregnancy and maternity has changed and now includes students. What to do when an employee tells you she is pregnant. Version 4 SPECIAL LEAVE POLICY. A Policy and procedure giving guidance on the Special Leave provisions within the Trust. Reference: Version: Issue Date: Classification: Maternity Risk Assessment Advice for Managers. Document Control. Change History.